Sun Devil Stadium is the home of the Arizona State University football team. You might also hear this stadium referred to as Frank Kush Field. Frank Kush was the head coach of the football team from 1958 to 1979 and owned an impressive record of 176-54-1. Kush was inducted into the College Football Hall of Fame in 1995. Frank Kush Field is actually the name of the surface, not the stadium, but everyone knows which venue you mean. When the stadium opened in 1958 it had about 30,000 seats. 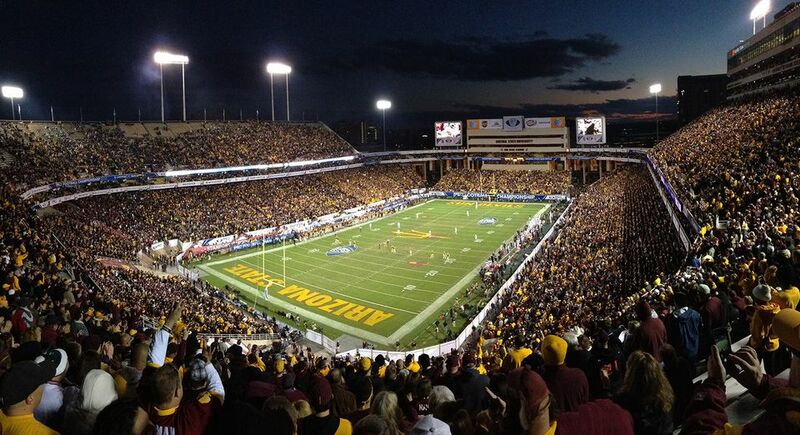 A few renovations later, more than 71,000 fans can watch Sun Devil football games here. The Carson Student-Athlete Center at the south end of the stadium houses all of ASU's 21 varsity sports coaches. The stadium’s seating chart will enable you to see where your seats will be at football games played at Sun Devil Stadium in Tempe. Student seating is in "The Inferno" section, the lower bowl south end zone. If you'd like to sit close to ASU's band (or if you want to avoid sitting near ASU's band), the musician's sit in the middle of the student section. Improvements made in 2018 include the connection of the east and west sides of the stadium on both the north and south sides so that all fans can access the main concourse. Enhanced security measures mean that fans will have to go through electronic screening at the entrances to the stadium. Once a ticket has been scanned you won’t be able to leave and re-enter the stadium. The stadium has a clear bag policy on a game day to help speed entry through security and into the stadium. It's important to read about the clear bag policy as it is very restrictive. You cannot even bring in a larger purse, diaper bag or a case for your binoculars. For the disabled, there is an ADA Courtesy Cart service from the main disabled parking area as well as the South Packard Drive parking garage and runs to the South East, North East, and North West Gates where you will go through security. The carts are restricted to the disabled person and one companion and a service animal. ASU is part of the Pac-12 Conference, along with Arizona, California, Colorado, Oregon, Oregon State, Stanford, UCLA, USC, Utah, Washington, and Washington State. ASU's chief rivals are the University of Arizona's Wildcats from Tucson. You can get single tickets about four weeks ahead of a game at the Sun Devil ticket office at Sun Devil Stadium or on the Sun Devils' website. Check the latest schedule on the website for Sun Devil Football game dates and times. The NFL's Arizona Cardinals used to play in Sun Devil Stadium but they moved to the University of Phoenix Stadium in Glendale in 2006. The Fiesta Bowl also moved to the University of Phoenix Stadium in 2007. The seating charts for the University of Phoenix Stadium vary from event to event.